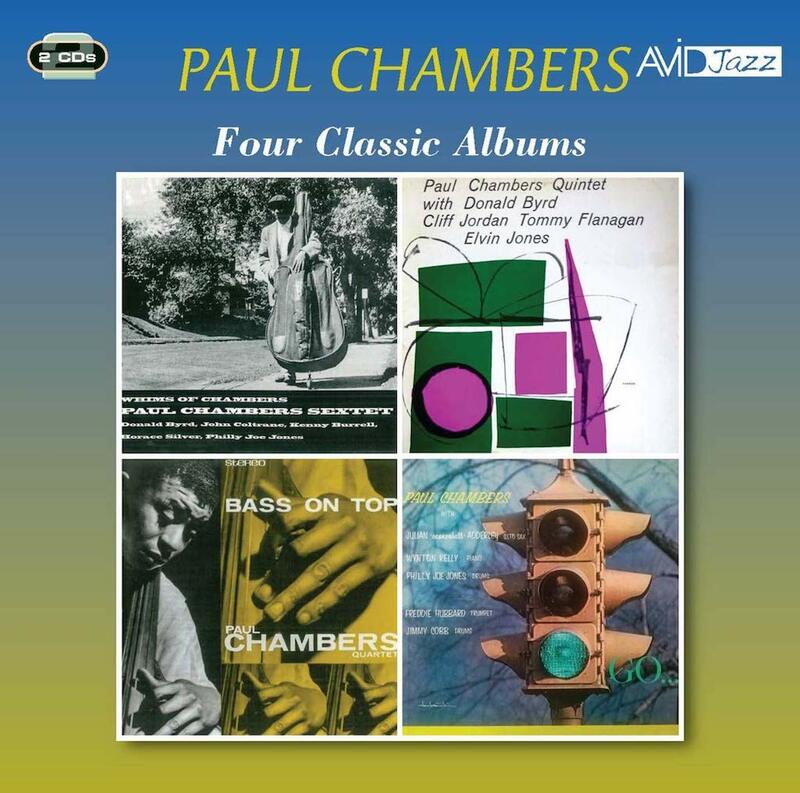 This two-CD set offers all three of Chambers’ LPs for Blue Note and one he made for Vee-Jay in 1959. The opening Whims of Chamber is a fairly typical hard bop set, Coltrane with a hard, grainy tone and Byrd blowing fiercely, forced along by a really tough rhythm section in which the leader joins forces with Silver and Philly Joe. It’s all good hard blowing, although Avid have mixed up the track sequence. The quintet disc is rather more laidback and lyrical, with Byrd more relaxed and Jordan blowing some tasty lines over a smooth but swinging section in which Elvin shows how well he teamed up with Chambers although they seldom recorded together after this. This disc appears to have been taken directly from the Rudy Van Gelder remaster; I recognise his touch. It was designed like the others to showcase Chambers as a skilled bass player both arco and pizzicato. Tommy Flanagan adds lustre as a lyric pianist with a lovely sound and a light swinging style. Paul and Elvin are on top form all through. Bass on Top is a quieter, lusher setting for Paul’s rich bass sound and neat improvised choruses. His dark, mahogany arco on “Yesterdays” is like a baroque cello with jazz phrasing. These are ultra-relaxed performances with just bass and guitar out front and a crisp rhythm section of Hank Jones and Art Taylor. Philly Joe’s driving attack is back on the first piece of the final Go session with Jimmy Cobb on all the rest and Cannonball turning this one into a slightly updated Whims-type workout. Freddie Hubbard, just making a name for himself at the time, blows scorching hot trumpet on three selections. Although he is more than adequately featured and impressive throughout, all of these LPs could have been under the leadership of almost any of the other sidemen. They are good examples of late 50s hard bop by some of its finest exponents. Chambers (b) with collectively: Donald Byrd, Freddie Hubbard (t); John Coltrane, Clifford Jordan (ts); Cannonball Adderley (as); Horace Silver, Tommy Flanagan, Wynton Kelly, Hank Jones (p); Kenny Burrell (elg); Philly Joe Jones, Elvin Jones, Art Taylor, Jimmy Cobb (d). New Jersey, 1956-57 & Chicago, 2 February 1959. "...good examples of late 50s hard bop by some of its finest exponents".